One week without a subscription to the World of Warcraft. I miss my guildies. It has definitely been an interesting week. I hadn't played too much for a few weeks before my subscription ran out so it's not the actual missed playtime that is weird. It's more when I find myself sitting down at my computer at the end of the day thinking, "What was I going to do again?" WoW was just THERE for me when I was 'bored' (i.e. had other things I should be doing, but would rather veg in front of a virtual fantasy world) - so now I'm trying to fill that time with other more useful things. Not that WoW isn't useful - it was a major help to me in stress reduction and winding down at the end of the day. So what do I do now that I don't play WoW? I have started learning some Jujitsu and playing sports weekly with coworkers. I wasn't going to share that here but a friend thought I should, so there you have it. Hopefully we'll see you all again soon - possibly with WOTLK! My 6 month subscription ends on September 23rd. I will not be renewing the subscription at this time for a number of reasons. I looked forward to Wrath of the Lich King, but looking at my reasons for not renewing, I'm not too sure that any of them are going to change even with the new expansion. The biggest one of these is I am missing out on a huge part of the game, and I will never experience those instances - I am talking about Raiding and the areas included therein. I also recognize that, while this IS "just a game" and real life always come first - the time and effort people put into getting to where they are, and raiding, is valuable to all those taking part. It takes a lot of time and effort to get up to the level cap and get all that shiny gear. So it's not really fair for me to take away from their precious time while I take care of family stuff. I always felt taken advantage for when questing with a friend and having to wait and wait and wait while they were off doing who knows what. I didn't like MY time wasted, and so I won't waste YOURS. 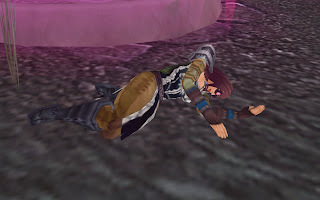 I'd like to say thanks to the WoW blogosphere for opening my eyes about many many aspects of the game. With the information I gained I was able to share YOUR wisdom with many people in game. I'm not completely gone though... and who knows - maybe the lure of WOTLK will bring me back. But for now, Tigersoul is on vacation. Okay so it's really more of a WANT, but I went and screwed it up. It kind of bothers me that you can screw this up so easily. There is no warning, no way of knowing how gleefully questing your way through the outlands you can make it MUCH more difficult to get what you want later. Well, no warning if you don't read blogs or guides. Unfortunately I didn't read too many blogs until AFTER I had reached 70 on Tigersoul.
! !DO NOT DO ANY QUESTS!! for the Cenarion Expedition until you have reached Honored with them!! It will save you lots of money and grinding later on. Granted I am about 40% through Revered Status, so I'm getting there, but I want Exalted! If you want to do it right - do what Nasirah says and you won't regret it. Unidentified Plant Parts aren't that hard to find or expensive to buy. When you are stuck at revered, the only way of getting more rep is to run Regular Steamvaults, Heroic Slave Pens, Underbog, or Steamvault, AND turning in Coilfang Armaments. So here's a quick monetary reason why BUYING 360 plant parts is preferable to Buying MANY armaments later on. Cost: 1-3g for 10 from AH. Possibly cheaper if you are lucky. Reputation Gain: 250 CE Rep - plus a bag of junk that might have Uncatalogued Species for more rep when you reach honored. Cost: 10-15 g EACH from AH. Reputataion Gain: 75 CE rep. Nothing else. As you can see... it's a LOT more expensive to get Armaments later. I have 8168/21000 rep. That means IF I were crazy and wanted to spend gold to get up to Exalted, I would need to turn in 172 more Coilfang Armaments which would cost me a minimum of 1,720 gold! Not to mention it would take FOREVER to turn in 172 armaments to the quest-giver! So I will be running SV with my guild, or Heroic SP/UB in order to get this. We ran Heroic Slave Pens last week and got about 2k rep, so I only have 6 more dungeon runs to go. That might not seem so bad - but with my schedule, and my guild being mostly in an opposite Timezone, organizing dungeon runs can be a hassle. So take it from me. Spend a couple hundred gold on Plant Parts when you are lvl 60 and get yourself to Honored that way. THEN do the quests. You'll end up richer for it in the end methinks! I had a very refreshing month and a half in which I didn't play WoW for more than 1 hour total in that whole time! It was very strange, I would log in, nobody I knew was online, nothing kept my attention, so I'd log off. My time was occupied by work, family, exercising (Forza is a lot of fun! ), Naruto and Bleach. A few weeks ago I logged in and decided to play a BG or two and got sucked in again. Nowhere NEAR the suckedinnedness of before, but I enjoyed it, and I felt like I should get more of the s2 gear, just for fun. I wish the Feral Druids S2 pants weren't a freakin dress!! I also spent the 1200 gold I had to make some Swiftstrike Shoulders and regem re-enchant a few pieces of my tanking set so some of the pieces would work more for tanking rather than PVP. Now to find the time to actually get into some Heroics. As for Katryona, I love BGs as a rogue. As long as I have some support I rip through Horde like crazy. When I'm alone, Warlocks, Mages, Elemental and Enhancement Shamans, Balance Druids and other Rogues usually die pretty quickly unless they have the s4 gear. A lot of fun. Now I have the S2 Shoulders and am working on more. Wow time is going fast. It has been one week shy of a month since I last posted an entry. Since that time I have been able to accomplish my goal of getting all my alts (not including the Druid Army) to 20 (The Druids will achieve that soonish I'm sure), my Priest to level 40 (he's 42), and my Warrior to 50 (51). Other than that though - I've had a hard time playing Tigersoul or Katryona... Tigersoul reached exalted with the Shattered Sun Offensive, got the awesome tabard and Neck piece, and haven't barely touched my 70s since (other than a few helping runs). I'm tired of dailies, tired of trying to level on a PvP server (with so many 70s it is seriously ridiculous). Add in the very good "Is WoW Still Your Cheese?" post by BBB, the release of the Age of Conan with NEWness, and the leaving of a bundle of wow bloggers, including the very first WoW blog I ever read, Adventures in Azeroth, and it really makes you think, "Why am I playing WoW" and "Is it worth it?" I still like WoW. I'm not leaving yet (although that day is definitely inevitable for all of us - WoW will not last forever! I am paid 'til September so we'll see what happens (if anything) with WOTLK until then!) but often I find myself logging in for a half hour or so before wondering what I'm doing and logging out. As for the status of this blog - It's not dead yet. I just needed a break. And it was a good one I think. I think my wife appreciated it as well, and that's always a good thing! I've been working on pvp gear and am now the owner of 2 shiny epics [Deathblow X11 Goggles] and [Gladiator's Right Ripper]. I am getting closer to the Left Ripper as well... but I kind of burned out on BGs last weekend. So I am undergeared for Arena's ... although I DO own all the Opportunist's set except the helm and shoulder because my goggles are better than the helm and I need to do Black Morass to get enough rep for the shoulders. So how did I do in my first arena outing? I was happy that we (2 Subtlety Rogues, yeah!) went 2 wins and 5 losses - although 2 of those losses were SO ridiculously close. First close one came down to me versus another rogue - the reason I lost was totally gear differences. He was in s1, s2 and a few s3 pieces, where I have the pvp-rep-blues. At his gear level compared to mine he SHOULD have mopped me up real quick, especially since I was at half health and he was full when we were finally one on one. His higher health finally prevailed. The 2nd close match was my compatriot vs a resto druid (I died from the leftovers of a FROST SHOCK because my cloak of shadows had 5 seconds left, doh!). Somehow Deadly Throw didn't work as she cheetah'd away, and the bear outlasted the hemos. After 7 games we finished the last three with our main chars (MM Hunter and Feral Druid) 2 wins, 1 loss. That 1 loss on our mains was ridiculous. We went up against a Hunter and Warlock team that I could NOT stay out of CC. The very next fight was a different Hunter and Warlock team that our rogues lost to quite badly earlier... we mopped them up so fast it was ridiculous. Definitely made me feel good. Normally I am not a vengeful person. In real life, revenge really doesn't make you feel better, doesn't really bring """Closure""" (sorry I don't really like the idea of closure, but meh) - but DANG. On a PvP server in WoW... successful revenge feels SO good. I really do enjoy Arenas. However, 10 games a week is usually more than enough to sate that hunger. Most of all have fun. Otherwise what's the point? I would like to wish a wonderful and Happy Mother's Day to all mothers out there, especially my own mother and the mother of my children. Without you I wouldn't be here and I love you for that. I very much dislike the Eye of the Storm Battleground. Yes I already ranted about this. I am in one as I write this trying to get enough marks for my first weapon. Really though, it CAN be fun... but that is usually only when you are winning. Like I JUST did wow that was great we 4-capped! Funny to be writing about how much I hate this BG I go ahead and join a gropu that wastes the other team. Sweet! There is a decent strategy posted at WoWWiki that, if followed, can win you all the EotS' you need! If you can help take (and of course defend) 3 bases you can win! Yay! So as I wrote in my last post - my REAL goal on my rogue is to get some good PvP gear upgrades. Last night I started the Battleground Grind. Alterac Valley is definitely still my favorite. Eye of the Storm CAN be fun, but is probably my least favorite because the games can go forEVER if it isn't played smart. (And unfortunately it rarely is) People often say Warsong Gulch is the worst because it really can go on for a ridiculously long time - but I've NEVER been in a WSG battle that has been even half as long as my longest EotS battle. So you can imagine my chagrin when I took a break from the madness and hopped over to the Hall of Champions to check out my first two shiny purple goals. Weapons!! Second: WHAT!?!?! 40 EotS marks to get my Main and Off Hand PvP weapons?? That is going to take forever. 40 marks is pretty bad for EotS. Then I decided to look at the armor and other requirements. YIKES! Even MORE EotS required! NOooooooooooooooooooooo!!!! Welfare Epics? That's actually a LOT of work! I'm not even sure how I got most of these on Tigersoul. Congratulations to my SECOND level 70 Character Katryona!! She also has a nice shiny new helicopter. Okay... so it really isn't shiny and it smokes a lot. But it cost me less than the 100g Gryphon! Next goal: Pickpocket every mob in the Outlands to find Spinesever or the Night Blade from a Strong Junkbox. That would be wonderful.